This is a link where you can read PDF versions of the National Nurse documents -- currently, the original guest editorial in the NY Times, the opinion piece in the Oregonian, and the National Nurse entry into the Congressional Record. It's important, as Teri gets introduced to more people through her interviews, that people understand who Teri really is. She is not a nursing instructor that hasn't touched a patient in 10 years! No, Teri is completely hands on. Teri is my role model because she is able to keep up with the latest clinical information, teach theory and apply it at the bedside, while providing all the personal and emotional support nursing students need as they confront issues they never imagined they would be in the middle of when they signed up for nursing school. In addition to that, she is also a nurse practitioner, and works in a clinic during the summer to stay up-to-date in that role as a primary care provider. Teri's energy is boundless, and her commitment to being a positive force for change beyond her corner of the world is inspiring to all nurses who think they'll never have a voice. Every person should have a nurse like Teri Mills. The Portland Oregonian newspaper reprinted Teri's NY Times Op/Ed today, Monday, May 30. The National Nurse Corps is another step closer to reality! Mr. Blumenauer: "Mr. Speaker, I would like to bring to your attention "America's Nurse", an op/ed highlighting the importance of nurses in our country that was published in the New York Times written by Teri Mills, a constituent of mine." In other news, Teri was interviewed for an editorial on her op/ed for the OR Manager today. Stay tuned, because we are hoping to have an on-line petition up soon for supporters to sign to urge Congress to set up an Office of the National Nurse. Hurrah for National Nurse Teri! My vote is YES for an Office of the National Nurse, and I vote for Teri Mills as our nation's first National Nurse!! Listen to Teri on the radio interviewed by nationally syndicated radio host Thom Hartmann! She was interviewed on Wednesday, May 25th on KPOJ-620AM in Portland, OR. Click on the title of this post to listen to the interview in Windows Media Player. You did a great job Teri! OMG Teri. You do rock! I think I missed the Tom Hartman show. Can you post a link to the archive if it's available? Hi, Pat. Thanks for posting a link to your column. I will have to check back frequently on the site. Teri, I was thinking of you today. I went to do my grocery shopping at my local organic place and noticed once again this Nurses Advocacy group sign. I always wondered what the group was. Apparently, they advocate on behalf of patients. So cool. They are also one of the groups, it turns out, I sent your article too. I am going to go back some time when they are open and see if they want to get involved in this National Nurse initiative. It's nice to see you just got this site up. You may have to get a web team because as the movement gets more steam, you are going to have lots of visitors! 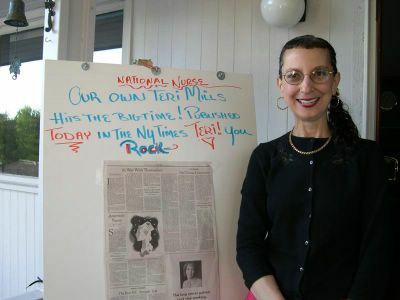 Our own National Nurse Teri Mills published in the May 20 NY Times! 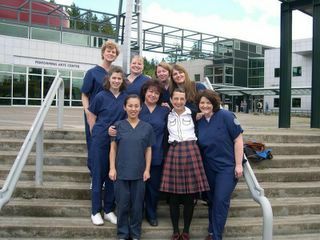 Great photo, National Nurse Teri! * Teri Mills extends her sincere appreciation and gratitude to Moses Ross, Thom K., all the Citizens for Democracy, the Rapid Response Network, and Mac Prichard for their help and support these past few days. * The Oregonian newspaper will be publishing Teri's op/ed from the NY Times - they even asked her for a picture to go with it. * Teri will be on Air America, KPOJ620 AM in Portland, OR tomorrow morning, May 25th at 8:05 am on the Thom Hartmann show. * Good Day Oregon, a local morning TV show, has scheduled a shoot with Teri and her nursing students to take place in the PCC lab at 9:30 am on June 1st. * Congressman Earl Blumenauer (D-OR) is looking at ways to place the National Nurse into the Congressional Record. * Two reputable nursing journals have asked to do pieces on the National Nurse. The American Associaton of Community Colleges has put in one request. The other came from the National League of Nursing, who plan to re-run Teri's op/ed on the back page of Nursing Education Perspectives in July. The Missoulian, Montana's state paper, published Teri's op/ed on Sunday. Unfortunately, they do not have on-line privileges with the NY Times, so there is no link to provide. * Finally, Portland Community College will be posting links to the op/ed in their weekly on-line newsletter. Teri will continue to keep you all abreast of news as it happens. Wow!! I thought getting an article in the NY Times was amazing -- but looks like that was just the first step! I am excited that this powerful idea is getting the attention it should. I look forward to seeing you in DC. Portland, Oregon - Teri Mills, RN, MS, ANP, proposes in an editorial published in the May 20 issue of the New York Times that the United States needs a National Nurse to best protect public health and to promote wellness education to citizens. The op/ed written by Mills has struck a chord among nurses across the U.S., many of whom are strongly in favor of a National Nurse appointment. The article titled "America's Nurse" was the third most emailed story on the NY Times website on its recent May 20 publish date. "Health care in the US is projected to cost $3.6 trillion or about 19% of the gross national product. Prevention is the best way to lower health costs. Who better than nurses to teach people how to do this?" states Mills, a Nursing Instructor at Portland Community College. Recent Gallup polls show that nurses are considered the most trusted, honest, and ethical professionals. Mills' website, http://www.nationalnurse.info/ documents her efforts to establish this national position and she encourages visitors to post comments. 1) To highlight education on specific health issues. Mills proposes a 15-minute live broadcast to the nation which would also be available on the Internet in both English and Spanish. 2) To assist in the creation of a National Nurses Corps to organize and coordinate activities, such as nationwide diabetes screening programs. 3) To introduce and support legislation aimed at protecting the public's health. One proposal Mills advocates is the labeling of foods that could lead to diabetes. The U.S. Surgeon General, Richard Carmona, recently stated that Americans don't understand diabetes but according to Mills, did nothing to help provide needed education on the issue. "A National Nurse is needed to promote health care in this country instead of providing sick care which is often expensive and unaffordable". Wow, another article. Wonderful. And they included your website. Teri, will you be posting your entire proposal on the website? With a history of how you came to forumlate it? I think that would be very interesting for readers. You are welcome to read the recent op/ed of mine that was published in the NY Times on Friday, May 20, 2005. Please click on "view my complete profile" link on the left and then click on the "Wishlist" link in my profile to be redirected there automatically. Teri, Congratulations!!! This is such a wonderful idea and is sorely needed. I'm so delighted to see nurses all over the country who are supporting your idea, Teri! You've started a movement! Your op-ed piece has inspired me! I've seen how tough nurses are fighting Schwarzenegger here in California. A National Nurse is exactly what we need to get things back on track for American healthcare. I'm not surprised to see that three days after publication your article still ranks among the top 15 "most emailed" of all New York Times stories of the last seven days. It's a terrific idea! Teri, congratulations on being such an inspiration. Your Times piece is now at #12 for the week. Great going!